** ATTENTION ** After the purchase you can get 3 randomized (random) activation keys for games under Steam absolutely free of charge. JUST LEAVE POSITIVE FEEDBACK for the goods with a request to send a bonus, and within 2-4 days the keys will be sent to the email you specified when purchasing! Titanfall is back! The continuation of the popular multiplayer shooter promises to be even more explosive, hurricane and memorable than the first part of the game. You are waiting for new multiplayer maps, 6 new titans, new weapons, deeper customization of characters, even more maneuverability, thanks to the cats, new finishers and animations in the battles between the titans, improved graphics. 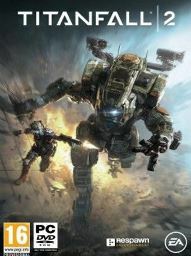 In addition to the hurricane multiplayer, players are waiting for a full-fledged single-player company, which will open the Titanfall universe like never before. You have to become a soldier who dreams of becoming a pilot of one of the Titans. By chance, you will be behind the front line, behind enemy lines, cut off from reinforcements and your command. You have to be united with the Avant-garde Titan who lost the pilot, and complete the mission to which you never subscribed. 6. After activating the game, a tab with your profile and a list of activated games will appear. 7. Download and install the game.